Please refer to our stock # be598r when inquiring. 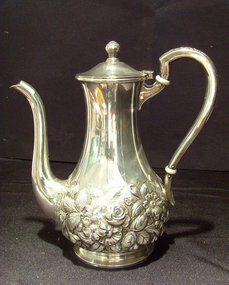 Wonderful sterling repousse teapot by S. Kirk & Son measuring 7 1/2" tall x 7 1/2" wide including handle. The markings on the bottom are 418AF, Sterling, Hand Decorated. This piece is absolutely beautiful!